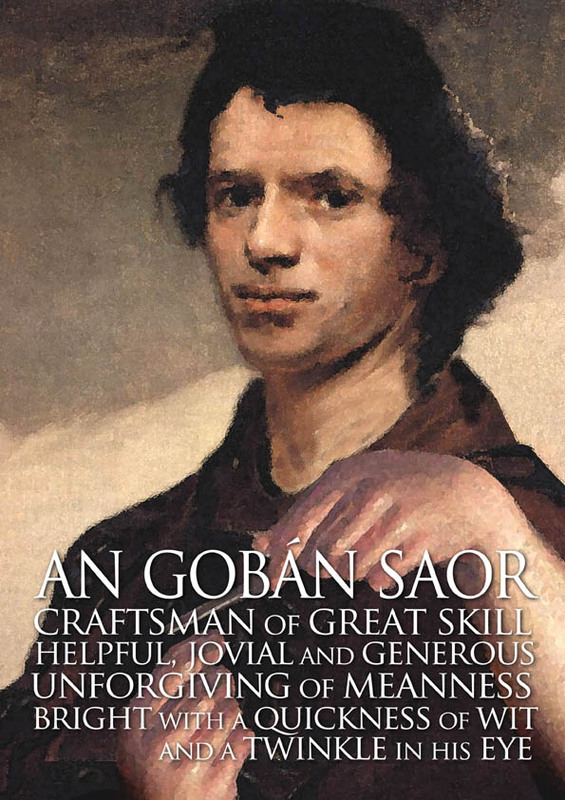 The Gobán Saor was the greatest craftsman and builder who ever lived in Ireland. He built mighty castles for all the lords, and for each of Ireland’s five kings. Though he was most famous for his skill as a builder, he could fashion a spear-shaft in the time it would take you to count to five, and make a spear-head with only three strokes of the hammer. When he wanted to hammer nails into a high beam, he would fling them into the air and throw his hammer after them, catching it as it came down after driving the nails into the beam. In this way, he was able to get through the work of ten men in short order. His fame spread all over Ireland, and after a time, his reputation reached the ears of the King of England. Now, the King of England decided that he wanted the Gobán Saor to build his castle for him, a bigger and a finer one than any other king had at that time, but he fretted that some other king could wait until his was built and then hire the Gobán Saor to build an even better one. The King of England decided that the only way to make sure this didn’t happen was to wait till his castle was built, and then do away with the Gobán Saor. Knowing nothing of his treacherous intent, the Gobán Saor set out for England with his son. They hadn’t been on the road long when he told his son to “Shorten the road for me.” Perplexed, the lad hadn’t a clue what his father was asking him, and so the two turned around and went home again. The same thing happened on the second day, and the Gobán Saor’s wife took her son aside and asked him what was going on. When he told her, she explained the riddle to him, and sent them on their way for the third time the next morning. This time, when the Gobán Saor asked his son to “Shorten the road,” the son took his mother’s advice and told his father a story to entertain him, and make the road seem shorter! The first house they stayed in on their journey had two daughters living in it: one dark-haired and hardworking, who didn’t sit still all evening, and the other fair-haired and charming, who preferred to sit with her hands crossed, talking by the fire than to do any work at all. The Gobán Saor saw that these girls were about the same age as his own son, and told his son he had a mind to ask for one of them for his wife. “But,” he said, “We must find out which is the better match for you.” So he called both daughters to him and gave them three pieces of advice, if they wanted to get a husband. The first: to always keep an old woman’s head by the range; the second: to warm themselves on cold mornings with their work; and the third: to take a sheep’s skin to market and come home again with the skin and it’s price. The rest of their journey was long, and on their way they helped out anyone they could. The Gobán Saor helped a poor man who was trying to roof a circular building using only three joists, none of them long enough to span the whole breadth. He made two grooves in one end of each stick and fitted them together so that they made a triangle in the centre, with the arms of the joists resting on the edge of the roof. Later, he met a group of carpenters who were struggling to build a bridge with neither peg nor nail in any part, and showed them how to construct a brilliant bridge out of posts and crossbars that got stronger the more weight was put on it. At last they came to the King of England’s site, and the Gobán Saor and his son set to work building the castle. It rose up out of the ground like a mushroom, so quickly and skilfully did they work, and people came from miles around to watch the Gobán Saor build. It was not many days before the castle was almost complete. That night, a serving girl came to visit the Gobán Saor and his son. She spoke both Irish and English, and she had overheard the King of England’s plan. She warned the Gobán Saor that when he climbed the scaffold to put the final capstone in place, the King had arranged it so that the scaffold would collapse, and the Gobán Saor would be killed. The Gobán Saor thanked her, and thought how best to get out of this. He went to the King the next day and told him that he always finished a building with a particular charm, and there was a bit of magic in it, but that he’d forgotten his tool for it. “Can my son go back and get it?” he asked. But the King refused. He didn’t want the Gobán Saor’s son to go free either, in case he might one day be his father’s match! He offered to send someone else instead. But the Gobán Saor explained to the King that his wife would not trust just anyone with this special tool: if it wasn’t to be him or his son, it would have to be someone with royal blood. So the King of England agreed to send his own son to get the tool. The Gobán Saor told him to ask his wife for “cor in aghaidh an caim”, an Irish phrase, which meant “crooked against crooked”. Some time later, the servants who had gone with the King of England’s son returned, downcast. They reported that the prince was having the best of times with the Gobán Saor’s wife, enjoying great hospitality and games, but that she refused to let him out of her sight, and all the Gobán Saor’s people were preventing him from leaving and said they would not let him go until her husband and son were back home safe and sound. She of course had understood her husband’s riddle at once! The King of England was furious, but there wasn’t a thing he could do about it but to let the Gobán Saor and his son go. For their part, they held no grudge, and finished his castle to perfection before they left. The Gobán Saor was delighted with this, and asked the man and woman of the house there and then if they would consent to her marrying his son. “And if her husband ever mistreats her, he’ll have me to answer to!” he said. The match was made, and the Gobán Saor sent for his wife to bring the Prince of England to the wedding feast on his way back home to his father.